Our research group is studying cancer and developmental related processes in various types of cells. The biological platforms that we are applying are tumor volumes, tissue slices, primary cell cultures, cell lines and stem cells. To study intratumoral heterogeneity, cancer stem cells, epithelial-mesenchymal transition (EMT), cell division, cell differentiation, and migration/networking we are applying state-of-the-art imaging techniques and modern genetic tools. Our focus is to shed light on the intracellular cell signaling mechanisms that have an impact on cancer and development. 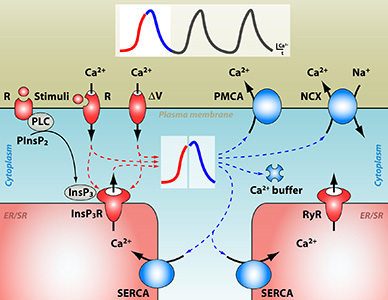 We are particularly interested in calcium signaling and how cells are modulating and decoding the frequency/amplitude of intracellular calcium oscillations. Calcium is an almost universal intracellular messenger that controls a vast number of cellular processes spanning from fertilization to cell death. Cells create large calcium concentration gradients (~10'000 to 1) between the extracellular fluid, cytoplasm, and internal calcium stores by means of calcium-pumps located in the plasma membrane and in the membranes of internal calcium stores. These gradients provide ideal conditions for the use of calcium as a cellular currency that supports the propagation of intracellular calcium waves. The concerted actions of calcium transporters located in the plasma membrane and in the membranes surrounding internal stores, including the endoplasmic and sarcoplasmic reticulum, the mitochondria, and the nucleus, can generate calcium oscillations. As with a radio transmitter, cells exploit the two key features of oscillatory signals - frequency and amplitude - to utilize calcium as a second messenger to generate a large variety of intracellular signals. This is an efficient way to use the same second messenger to activate many different cell processes. The lab is located on the 6th floor of the Biomedicum building at the Karolinska Institutet's north campus in Solna. To study cell signaling events in living cells, tissue, and animals we are applying various imaging techniques, such as fluorescence microscopy, confocal microscopy, 2-photon laser scanning microscopy, and light-sheet microscopy. All imaging setups are available in our laboratory. The unit is well-equipped in a highly vibrant research community with substantial resources and excellent core facilities.